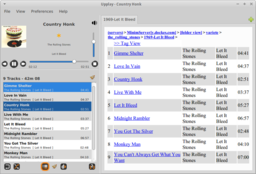 upplay is a desktop UPnP audio Control Point for Linux/Unix and MS Windows. It began its existence as a companion to the Upmpdcli renderer, but it has become an ugly but nice, lightweight but capable, control point in its own right. upplay does not play music, it controls a Media Renderer which may be running on the same host or anywhere else. upplay was started with code from the Sayonara local player, which saved me a lot of time. There is not much in common between them any more, except for quite many lines of user interface code. upplay is open-source, mostly free (I ask for a small contribution for the Windows version), and licensed under the GPL. It is written in C++ and uses the libupnpp library. Plays gapless using either the UPnP SetNextTransportURI action or the OpenHome Playlist service, depending on the device capabilities. OpenHome is chosen by default if available. In AVT mode, remembers the last playlist. Can move your current playlist to another renderer. Lets you browse any UPnP Content Directory on the local network and add music from there (click titles, or use the right-click menu for directory adds). Lets you search the server, and the local listing. Can control the connections between multiple Linn Songcast Senders and Receivers (multiroom synchronized playing). And washes dishes. See the manual. Binary or source packages for Ubuntu, Mint..., Debian, Fedora, openSUSE, Arch Linux, Gentoo, MS Windows. See the downloads page, for more information. There is also a short doc about building from source. I have moved the Upplay repository from github to a European site. The old github issues are archived here and you can open new ones in the new location. Version 1.3.3. Minuscule source changes mostly dealing with building and documentation. Version 1.3.1. Restoring the browsing state, other small improvements. See the release notes. Version 1.2.13. Small improvements. See the release notes. Version 1.2.0. Source switching for OpenHome renderers, control of their Radio service, and a new tool for managing Songcast connections, see the release notes. MS Windows port. This is still a bit experimental, see the details. Version 0.10.0: support pure OpenHome renderers with no UPnP AV services at all, like BubbleUPnP Server. This needs at least libupnpp1 (libupnpp 0.10.0). Please use the Disqus comments for praise, insults, or for tips which may help others. Use the issue issue tracker for problem reports and enhancement suggestions. Use E-mail if you run into trouble, I'll be glad to help: jf at dockes dot org.